Rivers are fishing well remember we only have three weeks to go. Mr Samuels said that he hoped all anglers would recognize the need to protect the river because without it remaining in pristine condition it places the brown trout spawning run in jeopardy. While there may be a bit of a walk in the future, he said, the benefits to anglers and the fish will outweigh any inconvenience. 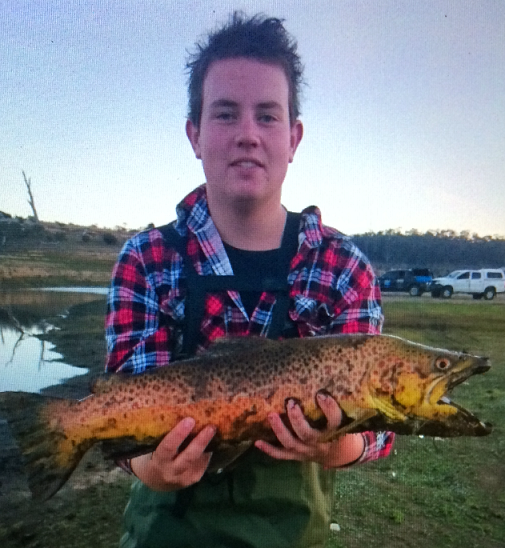 Fishing the Monaro is the way to go!! Things are looking pretty good from top to bottom on the Eucumbene with most fishers doing well on bugs and nymphs best times have been early mornings and late afternoons. At the moment it doesn’t matter where you go on the river the fishing is great so with only two weekends to go thing will only get better. 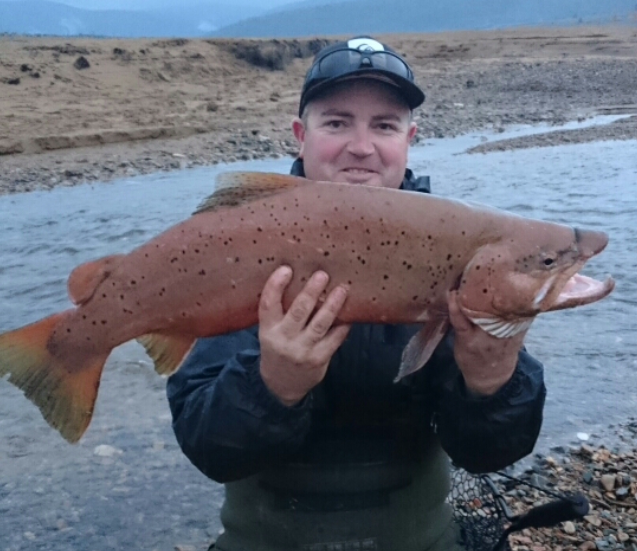 Peter at Braemar here with an updated fishing report for the week ending May 21st 2106. Finally some stability with the Lake level this past week, it did drop sightly after last weeks increase, lets hope the plug has been put back in for a while now but significant rainfall would certainly help everyone who relies on the water for one reason or another. The weather has been all over the place recently, with very very high winds and drizzly rain mixed with cold temps, so getting out and about was a bit of challenge indeed, as a result only a few diehards bothered to fish at our end of the Lake. Geoff Davis was here for a 2 week period and he endured every possible weather condition conceivable, Geoff picked his days and ventured out on 5 occasions over 2 weeks and managed 23 beautiful fish, mostly rainbows up to 45cm in very good condition, some throw backs were encountered, but generally all fish were feisty and hungry, a combination of # 37, # 106 and # 13 Tassie’s proved to be successful. The bait fishing has been a bit difficult, powerbait and chunky cheese accounted for a few fish with Daryl Suckley doing well on a couple of outings, other anglers had absolutely no luck with anything, so its a mixed bag right now like it has been for most of the season. There have been many fish sighted cruising close to the banks in the past few days, Bryce Dodsworth all of 5 years old, managed a very nice Rainbow last Friday spinning from the bank with a Tiger Pegron, with Grandad Michael on hand and put to shame, Michael did advise that several fish were seen making their way up Andy’s Inlet, no doubt following the trenches and Creek in preparation for some sort of spawning activity. There are unconfirmed reports that a 5.8kg Brown was caught over near the Tolbar mid week, my source is usually reliable but at this stage no photographic evidence has been provided, although given the time of year and the Browns now in full spawning mode it is not unreasonable to think that this report is genuine. On a side note, to all those fishing people that intend making a trip to Braemar, please be advised that there will be restricted access to the Lake from all points across Braemar and the surrounding access tracks over the next 5 weeks, the track leading through Braemar will be closed to all traffic whilst repairs and re-conditioning of the road are implemented, it is strongly advisable that anyone planning on coming to Braemar that they first check at the office or call ahead on 0264568805 to find out the updated situation on access, access will be limited to walking only, no boat access can be gained to any points at Braemar during this period, again, No Boat Access at Braemar until Further Notice. Lake Eucumbene is still dropping but the fishing has been ok most trollers have been doing good up around anglers reach with some good rainbows and browns. 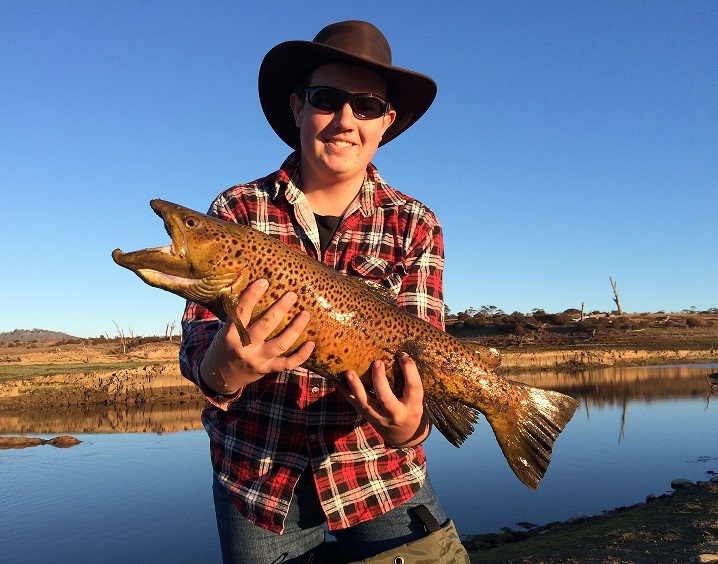 Tassie’s have been going well and Rapala’s, Over at Braemer Bay thing are going well with some good browns most rainbows have been caught early in the morning again Tassie’s have been the pick. Buckenderra has been a little quiet but as we know thing can change quickly at this place so still worth trying. At frying pan things are going ok the rainbows are still hanging around so this place is worth a try early mornings are the best. Jindabyne has been ok with some good reports coming from Kalkite, wast point, poo bay, Hatchery bay if you are fishing after 10 am go find the deeper water and try the worm under a bubble and power bait with a two meter lead don’t go out there doing the same old thing try something different longer leads and worms with a bubble float that will keep the yabbies away from your bait. Mud eye's are working well all over the lake But we are finding them hard to get. Yes we have mud eye's but running out very quickly sorry we are not taking any orders for mud eye's. Overall the fishing is ok you just need to find the right time and spot and that would be late afternoons and in the deeper bays.